Honest reflection is a lot like the start-up journey – it is hard and gritty but if you throw yourself into the process, it will transform and strengthen you. This piece is for any one involved (or interested!) in the journey of startups, especially regarding social enterprises and the duality of success and failure. It is an analysis of four factors that led to the closure of Milaana’s operations as well as what lives on from this experience and how this longevity was created. Written from my perspective as founder, I have taken great care to ensure it is a true reflection of the organisation by also integrating the insights of our team. You’ll notice the term ‘I’ used heavily when discussing Milaana’s failings and ‘we’ regarding the successes. This is because as Milaana’s founder and leader I failed to steer Milaana to economic viability, but as a team and community we were successful in achieving a lasting impact. It can feel liberating to use the terms ‘F*&K ups’ or ‘failures’ but in reality, the things that hurt us most weren’t monumental doozies. They were the hundreds of little decisions that I made, which prioritized impact and process over income and profit. These accumulated over time and when I finally acknowledged the position we were in, I was looking over the edge of a fault line towards Milaana’s economic failure. (Geographic) A crack in the earth’s crust resulting from the displacement of one side with respect to the other. (Cultural) A potentially disruptive division or area of contention. Every social entrepreneur must balance two forces – maximizing community benefit on one side and maximizing profit on the other. Our global reality is that these forces have been pulled in opposing directions for to long, creating a fault line through which far too many fall. Exploring the symbiotic nature of social enterprise and this fault line is an article in and of itself (coming soon). I failed to manage this balance and Milaana fell into the gap. Any founder and manager will tell you the hardest thing to do each day is to prioritize how to spend your finite time. My focus centered on impact (what we created), connections (who created it) and an authentic process (how we created it). In retrospect I should have put more focus to developing a strong team of co-founders, driving high margin sales, saturating the local market before scaling and finally, raising capital to fund the growth needed to reach sustainability. These areas could have prevented the lack of funds and founder burnout that marked the end of Milaana’s operations. If I had assembled a strong team of co-founders, I possibly could have mitigated the other core failings. With their added experience, time and energy, a team of co-founders would also ensure I wasn’t the organizations main constraint and in the end, liability. Whilst I didn’t ave co-founders, I certainly wasn’t alone. Throughout our journey we had INCREDIBLE students in a variety 3-6 month roles and their energy, ideas and decisions were core to our development. But none had ownership stakes. I raised the possibility with some, but the timing and/or our inability to pay, thwarted these attempts. We also had an informal group of ‘Wise ones’ including mentors, advisors and non-executive directors who I’d call upon for advice and send monthly board reports to. Strategically adding to this group and formalizing it as a board would have provided further support, but it was in the trenches that the greatest help was needed. In mid 2014, I followed an opportunity to move to Sydney to work from ATP and test our ability to scale and remotely manage teams. We grew our team from three in one location to 24 across two states in a matter of months. It forced us to develop the core systems and processes that would allow further expansion and I learnt SO MUCH from being based in Australia’s heartland of tech startups. But it was too fast, too soon, we’d only just launched our minimum viable product (MVP) a few months prior. By not saturating our home market first, we were scaling with a partially but not fully validated model and a platform that still required a lot of manual input. Inconsistencies in communication and team co-ordination and not personally engaging in all of the hiring decisions meant we were also putting A LOT more effort into people management for reduced (or certainly unequal) per capita output. 3. Reduced focus on sales in late 2014. Spending so much time and effort managing our sudden inter-state growth, I was also increasingly distant from the customer experience and sales. Furthermore, to ensure positions were filled, we had to sustain a ratio of 20:1 in terms of students registered for each position. With a strong baseline of 100+ organisations, we quickly fell behind in student numbers. Engaging students was more expensive in terms of marketing and had no immediate financial reward. So we built our volunteer teams (through student societies) around this purpose. We ran an incredibly lean ship! With a $10,000 loan for the prototype, $20,000 in crowd funding and grants for the MVP, our small (but existent!!!) income then went to operational costs and marketing. With just this, we not only survived two years but we developed quickly and provided a valued service. However, the structure of our model meant our growth (a core motivating factor for our team) would potentially stagnate without capital. A model dependent on volume. Milaana’s low fee, subscription model for organisations required a high volume of users to be sustainable. Reaching this point would allow us to pursue revenue streams with much higher profit margins. First, by integrating the private sector (by including Corporate Social Responsibility projects and connecting corporate staff as mentors on existing Impact Placements). Second, helping our proven students enter the job market by partnering with like-minded recruitment firms. To reach the required volume, it became clear we needed substantial investment (~$250,000) to support a full-time team, further product development and fund a marketing drive. Itching for Impact Investment. I waited until we had solid growth to stand on (late 2014) and then started chasing any scent of impact investment. Barking up quite a few trees, this pursuit took me to Washington D.C in May 2015 to pitch at the global semifinals of a Venture Capital (VC) run competition, the 1776 Challenge Cup. The ultimate winners were already making $100,000s or even millions. It was at this competition, that reality hit. Impact Investment is in its infancy (especially in Australia) and even with our traction and demonstrated viability we weren’t cute (front line impact) enough for philanthropic investors or billion dollar enough for the rest of the investment community. Another 12 months of further demonstrating our viability and pitching my heart would increase our chances but the reality of my personal circumstances had also hit. Personally, I’d reached a point where I was ‘running on empty’ financially and emotionally. I’d graduated from university over a year ago and paid-consulting work here and there was great but it couldn’t cover my costs. My parents had generously plugged the holes but 12 months of this was the limit. Even if I could secure long-term co-founders (including a front- and back-end expert to continue product development), it would still take at least one more year of everyone volunteering to reach an almost viable level. I even experimented with reducing my engagement and seeking part-time work but this wasn’t a practical solution. Stepping back at this crucial stage without a clear replacement was unfair to our team and would result in stagnation. It was either – get investment NOW, or ‘call it’ whilst we were still ahead. After much sleeplessness and with a heavy heart, the preparations were made. We thanked and closed down all the teams at the end of the semester and our software was taken offline on the 17th of July, Milaana’s 2nd birthday. When I typed in milaana.org and no longer found our beloved platform, there was a painful, sinking feeling in my gut. But then it redirected me to milaanaopen.org, the open source home where our successes live on and have the chance to continue growing. Part 2 – SUCCESS, What is it and how do you make it last? Whilst my inability to lead us through to achieving the last, we all still feel successful due to what we achieved with the first three. Definition of ‘to impact’ (verb): to influence, to alter. Making impact as a social enterprise requires defining a social problem and then crafting an innovative solution that generates lasting social impact. Two markets are facing painful shortages. 1. University students need access to quality, real-world learning experiences to prepare for their careers. 2. Community organizations need to engage skilled volunteers that will improve their sustainability and increase their impact. From these emerged the specific problem that our platform addressed – students and community organizations have SO much to offer each other (and the community) but they need a better way to connect. Milaana.org was created as an online marketplace for cause-driven projects. We found our niche between internship and volunteer platforms by focusing on supplying COMMUNITY projects for student internships and SKILLED, YOUNG volunteers for organizations. We also worked hard not just to facilitate connections but to create materials to increase the likely success and impact of these projects. We had a viable mode. Founding Milaana in July 2013, we took the prototype to market in September 2013 and validated the need. Upon launching our crowd funded MVP in June 2014, we started receiving subscription fees from registered organizations. This proved the next stage of growth was feasible so long as we stayed lean. We knew we were creating social good but how much good? To what end? With the support of the Impact Academy, we defined and measured our impact according to the number of successfully completed Impact Placements. A placement is deemed successful when at its end, it has clearly generated positive impact for the organization, the student and the overall community. So whilst we registered 100+ organizations, 900+ students and had 200+ applications through the site, our baseline impact was the 58+ success stories. You can find some of these stories here, including those of our team. The epitome of Milaana’s impact and philosophy – Our Team! Over 65 students joined the Milaana Tribe in positions ranging from university ambassadors to national and state coordinators. It was such a privilege to watch individual members transform with the confidence, community and purpose they found in Milaana. You can find their stories here — like Sophie who started as a talented but shy social media hero, then formed and led a whole a editorial team! When she finished, she continued to mentor the new team whilst becoming a paid writer, launching her own cause driven enterprise AND finishing her degree! Our team members were never referred as ‘interns’ despite this being technically correct. Instead, they were our Heroes and were given titles worthy of their amazing contributions. Like Sam – our CTO (Chief Thought Officer) who put his Philosophy Degree into practice tackling thought puzzles like “The Ethics of Unpaid Internships’. We had to shake up a lot of typical business practices to cater for our unique culture. Like turning the traditional organisational chart upside down to reflect our leadership philosophy. Leaders at the bottom as strong foundations and branches to support and nourish all those rising up from the core of Milaana. I was delighted that it happened to resemble a tree – the ultimate symbol of growth and sustenance. Two words that beautifully describe what our community provided. Milaana’s Organisation Chart & Family Tree! As our name implies, Milaana’s focus, and my core philosophy all centre on facilitating connection. Indeed it is safe to say that 60% of my time and probably 80% of our teams time and effort was spent on human interaction and connection à building a community. We did this in three ways – online through our platform (as explained above) as well as offline through in person ‘Connect’ events and of course, within the Milaana family. Through our ‘Connects Events’,we brought like-minded students together with local social innovators. At these ‘connects events’ we shared the basics of social enterprise and our #dowelldogood philosophy, as well as tips for their Impact Placements. We’d then hand over to home-grown social entrepreneurs and charities who brought our words to life with their stories, visions and opportunities to engage. The energy was always electric when the networking began and the real connections formed. These events also caused huge spikes in traffic and conversations through the platform. Above all, the greatest connections made were within our team. Connecting these incredible young leaders through Milaana and seeing teams and friendships grow within and across the teams was extremely energizing. We worked hard but we also ensured plenty of time for the team to bond through our dinners, retreats and coffee catch-ups. Expressed in endless forms, a Milaana archetype definitely emerged – an over-achiever motivated by impact. The unifying nature of our shared aspirations to ‘do well’ for ourselves whilst also doing GOOD for our community meant that we didn’t fear the diversity of our team. We celebrated it! The friendships, alliances and cross-pollination of diverse people and ideas that have emerged throughout the Milaana community are enduring reminders of Milaana’s spirit. In practice, this means every action we take should not only increase benefit for us as an organisation and/or as individuals, but also create value for the broader community. The zero-sum game mentality has no place in our world. There is no longer ‘work vs. life’. There is not longer ‘profit vs. community’ benefit. Most fundamentally, there is no longer ‘me and my tribe vs. you and yours’. ESPECIALLY if we are working towards similar goals. We chose not to see similar platforms as competitors, as the dynamic of ‘us vs. them’ didn’t make sense to us. No one should have a monopoly on creating opportunities for students or connecting organisations with skilled volunteers. Indeed we wanted to CELEBRATE anyone working in these areas and to work along side them to increase the quality of our offerings whilst ensuring adequate differentiation. We created this map to show students all the great organisations and pathways available to help them to #dowelldogood. We had to shake up a lot of typical business practices to cater for our unique culture. Like turning the traditional organizational chart upside down to reflect our leadership philosophy. Milaana.org was a beautiful platform but we were never a ‘tech start-up’. We were a group of passionate humans, utilizing ‘tech-knowledge-y’ to connect humans who wished to help other humans. We even made ‘Milaana’ human by personifying ‘her’ so that new team members could easily connect with and embody the Milaana culture. One team member said “When I don’t know how to talk to a student, or tackle a problem, I now think – What would Milaana do?”. To our team, Milaana was no longer an organization but a mentor who embodied our collective values. As a result of this, when we talked to potential clients, raised awareness of our crowd-funding campaign or pitched in competitions, it was easy to connect with each audience through our ‘WHY’. If they cared enough about our ‘Why’ and then, believed in our ‘How’ and ‘Who’, they engaged. And SO many did! We had so many mentors, community champions and students who dedicated energy, talent, time, money and connections to support us. From the mentors and workspaces of Incubate, Impact academy, Yunus&Youth and ATP, through to our software developers at Net Engine – all our partners truly went above and beyond the call of duty. As it turns out, the startup community is an extremely generous one! Indeed the greatest support personally was found in peer mentors (other founders) sharing their own experiences from the trenches over countless coffee dates of vulnerability and hilarity. And then there are our crowd funders! 72 people donated to our Pozible campaign, raising $15,000+ to help us build our MVP! I spent a whole weekend signing certificates and writing thank you letters to our supporters. My mistake-ridden but sincere letters showed our human essence and gratitude. Each hour of writing that passed allowed the gravity of all these people supporting Milaana’s vision to sink in. If you had any doubts about how I could so easily “give away everything we’ve created” through open sourcing, it should now be clear. Milaana was never ‘mine’, I simply provided a bit of direction, motivation and support. From the very beginning, Milaana’s existence has been thanks to the community that supported us. Understanding your shortcomings personally and as a leader is a sobering and at times painful process but it brings with it a sense of peace when all has been given light, including the successes and all that will live on. If I had taken the time out for this depth of reflection during the journey, perhaps I wouldn’t need to write this piece at all. But with this process now complete, I’m letting go of the ‘perhaps’ and the ‘what-ifs’. Hindsight is valuable for reflections and learning but it is vision and aspiration that will carry us forward. 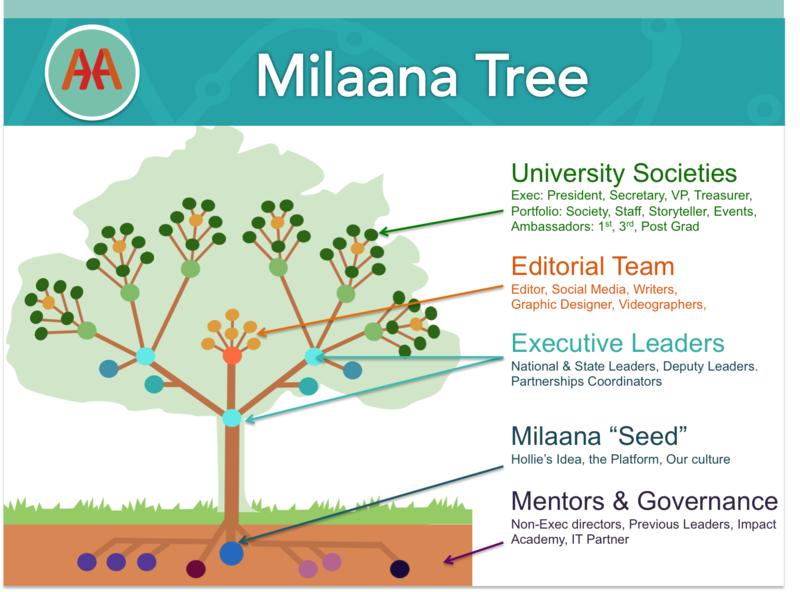 The vision for Milaana now is to be a valuable open source resource and to actively support all who wish to facilitate community engagement. It’s a fundamental law of physics that energy cannot be created or destroyed, it simply transforms from one form to another. So it is with Milaana. I observed a gap, then tapped into the energy of a whole community and guided this energy to facilitate connections and impact within the form of Milaana. The form is no longer, but everything created during this experience will continue to evolve. By open sourcing, I just want to give it a little nudge so that our desired impact can perpetuate. How ‘successful’ our open source experiment goes on to be simply depends on leaders stepping up to take hold of this energy and transform it to best serve own communities. If you are interested in getting involved, visit our Open Source Materials and get in touch. THANK YOU to all who have made this experience and these lessons possible and to all through whom Milaana’s vision lives on. If you found this interesting, you might also be interested in reading— “To Connect is to care. When you Care, You Act”. An article making sense of the personal narrative and values that grounded both the start and end of Milaana. Thank you so much for sharing your journey Holly. Even though it was short-lived, you have certainly made a huge impact, and will continue to do so. Well done, and best of luck for the next chapter. Thank you so much for your kind words Paul, it’s been an amazing experience and I certainly am excited for whats to come! Incredibly well written Hollie. An incredible journey regardless of outcome and a seed in many people’s lives for personal and philanthropic growth. Looking forward to your future impacts.